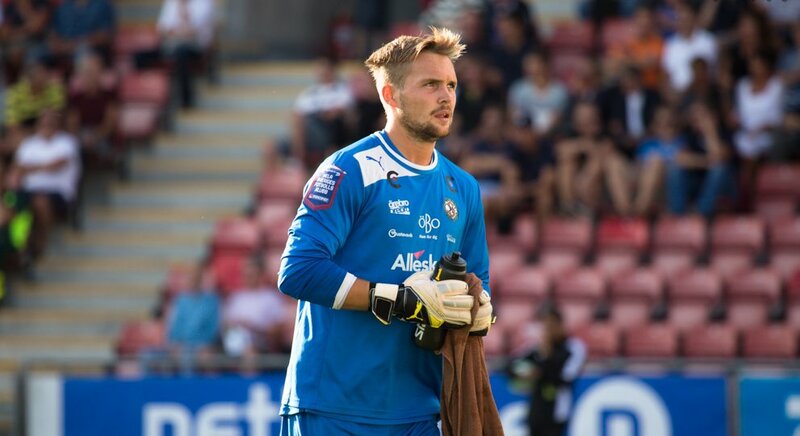 James Rowe interviewed Orebro SK’s Swedish goalkeeper Oscar Jansson exclusively for WFi. They spoke about Jansson’s time playing for his hometown club, his days at Tottenham Hotspur in England, and representing his country at youth level. You signed for Orebro SK in 2013. How does it feel for you to play for your hometown club. Are you enjoying it and how would you describe Obrebro SK as a club? I made the decision to come back to Sweden after a few years living and playing in the UK based on playing first team football. I was at the stage where I was training with the first team at Tottenham Hotspur and I did not really get any matches. Orebro SK was promoted in my first season back and ever since we have been playing in the top flight.I am enjoying it and it is a good thing to be home playing for your hometown club but there is also a lot of pressure. The majority of the town seems to ask you questions when you are a home based player playing for your team. It comes with a big responsibility. I hope my career can go further and just stay here for the rest of my career. You mentioned Tottenham Hotspur, and you spent a period of your youth there and were heavily involved with the club. How do you look back on your time in London and do you have any particular highlights? I had a great five years at Tottenham Hotspur and I matured a lot not only as a player but also as a person because I moved away when I was quite young from Sweden. The last few years I was with the youth team training with the first team every now and again. When Juande Ramos was there as a manager I was involved more with the first team. The highlight of my five years was when I came on against AS Roma at White Heart Lane to a full house. Even though it was pre-season and I was only 17 at the time it was a big thing for me. It helped me a lot to learn from the great players that were already there and training with top players.It was a great experience both on and off the pitch. You also spent time playing for Shamrock Rovers in Ireland. How was it for you to go from English football to Irish football, and also playing for a big club in Ireland? How do you look back on your time at the club? I spent eight months in Ireland is was one of maybe four of five loan spells that I had from Tottenham Hotspur. But it was my first season playing regular senior football and I learned a lot. It was a great experience. At the time Shamrock Rovers qualified for the Champions League having won the league the season before I arrived. It was a tough eight months because I did not know anybody in Ireland, and socially it was quite tough, but looking back on it now it was a good experience because I got to play almost 50 matches that year in the league and cup. When I look back on it now I am happy that I did it. Shamrock Rovers was the longest loan spell and helped me go from youth football into men’s football. You represented Sweden at youth level and you have also been capped once for the senior national side. What are your memories on representing your country at youth level and gaining a full international cap? I represented Sweden at youth level and Tottenham Hotspur scouted me when we played Croatia away at under 17 level, and that had a big impact in my career. I would say that match against Croatia paved the way for my move to England and to kick on from there. Making your full debut for your country is a big thing. I have been involved four times with the Swedish national team squad having played one match but it was a great honour. Also the selection when I made my debut was from the Nordic countries, because the main leagues in Europe where still playing. I hope to be involved more regularly with the Swedish team going forward, but that will be difficult because there is a lot of good young goalkeepers coming from Sweden right now. I can imagine as a goalkeeper, Oscar, that you have played alongside some great players. Are there players that you have played alongside that have stood out for you? I played with a guy that has just won the Ballon d’Or — Luka Modric! — and also his team-mate at club level, Gareth Bale. Everyone that I played with at Tottenham Hotspur when I was involved with the first team were world class players. I played with Ledley King — probably the best defender I have ever played with. The way that he could read the game was tremendous. He was not the most vocal player but he was like a silent leader in the way he did everything so perfectly. I am so proud that I have had the opportunity to play alongside him. I have been fortunate to play with lots of good players through the years especially during my time at Tottenham Hotspur. Could you say who are the most difficult opponents that you have faced during your so far Oscar? I played against Eden Hazard for Sweden against Belgium at under 19 level, and he was unbelievable. We lost 4-1. He scored three goals and set up the fourth. He was on another level even back then. You could see that he was going to become a world class player. In the match which I played against him, it was the best performance that I have ever come across. As you get older you do not seem to get standout players in the way he stood out in that match with his skills and movement. I played against a lot of good players in England but in terms of opponent, Eden Hazard is the one that stands out for me the most. Finally, Oscar, you have already mentioned Juande Ramos, but I wanted to ask if there were any particular managers that played a key role in your development as a professional footballer? There are always managers, but I also like to see all the back room staff as a part of that too. Perry Suckling who brought me to England has been a key person for me. He was the goalkeeping coach at the youth team at the time but when Juande Ramos took over at Tottenham Hotspur, he was involved with the first team. He had a key role early in my career. I would say that Perry was the most important one because he gave me the chance to come to England and train with the first team. I also believe that when Juande Ramos came to Tottenham Hostpur the biggest changes he brought to the club were small details and tactics. His approach surrounding football with food and dietary methods was very new in the club at that time. He was specific with a great attention to detail and that had a big impact on the rest of the game really.